When we handle an image for Retina displays, it makes sense to deliver a crispy, high resolution picture to the browser. When we send the same image to a mobile with a small screen or to a tablet connected with low speed, it’s efficient to save bandwidth and to reduce the loading and processing time by providing a small size picture. In HTML, a browser’s environmental conditions are primarily expressed as CSS media features (orientation, max-width, pixel-density, …) and CSS media types (screen, print, …). Most media features are dynamic (a browser window is resized, a device is rotated, …). Thus a browser constantly responds to events that change the properties of the media features. Swapping images provides a mean to continue communication effectively as the media features change dynamically. When we display an image about a subject (i.e. the brain structure) at a large size, it makes sense to show the context. When we display the same image on a small screen, it’s useful to crop it and to focus on a detail. This differentiation is ruled by art direction. The @media query inside CSS or the media tag inside the link element are the key ingredients for responsive design. There are several tactics for deciding where to put breakpoints (tweak points, optimization points). As there are no common screen sizes, it doesn’t make sense to base the breakpoints on a particular screen size. A better idea is to look at the classic readability theory and to break the layout if the width of a column exceeds 75 characters or 10 words. These are the breakpoints. Vasilis van Gemert created a simple sliding tool to show the impact of language and font family on the text width. On June 20, 2014, Anselm Hannemann, a freelance front-end developer from Germany, announced on his blog that the <picture> element and the attributes srcset and sizes are now web standards. The discussions and debates about the specification of a native responsive images solution in HTML lasted more than 3 years inside WHATWG, RICG and W3C. The Responsive Images Community Group (RICG) is a group of developers working towards a client-side solution for delivering alternate image data based on device capabilities to prevent wasted bandwidth and optimize display for both screen and print. RICG is a community group of the World Wide Web Consortium (W3C). The group is chaired by Mathew Marquis of the Filament Group and has 362 participants, among them the Responsive Web Design pioneers Nicolas Gallagher, Bruce Lawson, Jason Grigsby, Scott Jehl, Matt Wilcox and Anselm Hannemann. The RICG drafted a picture specification (editors draft July 1, 2014) with the new HTML5 <picture> element and the srcset and sizes attributes that extends the img and source elements to allow authors to declaratively control or give hints to the user agent about which image resource to use, based on the screen pixel density, viewport size, image format, and other factors. With a mobile-first approach, the image “brain-mobile.jpg” is rendered by default, the image “brain-tablet.jpg” is rendered if the user screen is at least 480px wide, and “brain-desktop.jpg” is rendered if the user screen is at least 1024px wide. 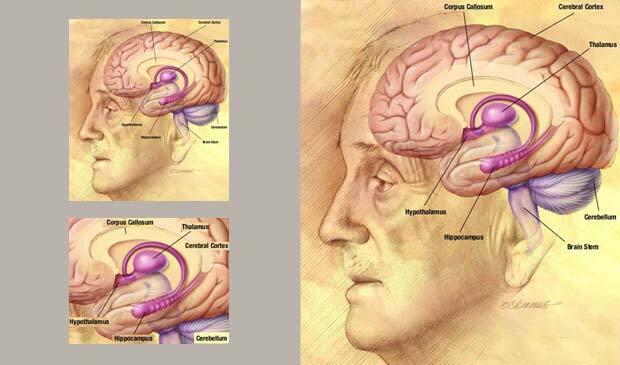 The image “brain.jpg” is destinated to those browsers who don’t understand the <picture> element. The second URL in the srcset attribute is paired with the string 2x, separated by a space, that targets users with a high-resolution display (like the Retina with a pixel density 2x). In the second example the sizes attribute is used to let the image cover all the width of the device (100%), regardless of its actual size and pixel density. The browser will automatically calculate the effective pixel density of the image and choose which one to download accordingly. The four images brain-mobile.jpg, brain.jpg, brain-tablet.jpg and brain-desktop.jpg not only have different dimensions, but may also have different content. This way authors are enabled to display different images under different conditions, based on art direction. The <picture> element should not be confused with the HTML5 <figure> element which represents some flow content. The <figure> element is able to have a caption, typically the <figcaption> element. The sizes syntax is used to define the size of the image across a number of breakpoints. srcset then defines an array of images and their inherent sizes. <img srcset="brain-low-res.jpg 1x, brain-hi-res 2x, width="320"
We tell the browser that there is an image to be rendered at 320 CSS pixels wide. If the device has a normal 1x screen, a low resolution image 320 x 240 pixels is loaded. I the device has a pixel ratio of 2 or more, a higher resolution image 640 x 480 pixels is requested from the server by the browser. The srcset attribute tells the browser which images are available with their respective pixel widths. It’s up to the browser to figure out which image to load, depending on the viewport width, the pixel ratio, the network speed or anything else the browser feels is relevant. sizes="[media query] [length], [media query] [length] ... etc"
We tell the browser that in viewports between 0 and 20 em wide the image should be displayed 240 pixels wide, in viewports between 20 em and 48 em wide the image should take up 80% of the viewport and in larger viewports the image should be 65% wide. Can I use responsive images ? 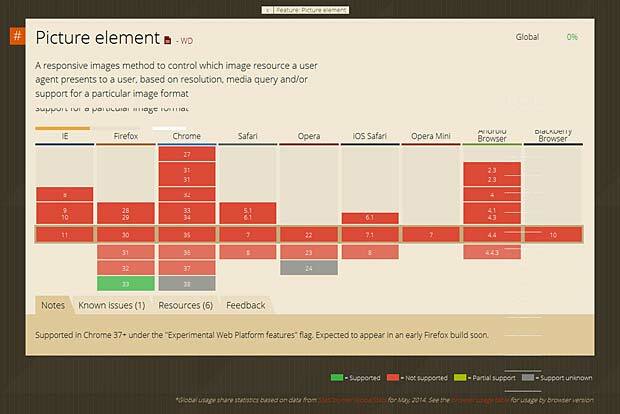 The support of the <picture> element and the srcset and sizes attributes in the various browsers can be checked at the “Can I Use” website. This site was built and is managed by Alexis Deveria, it provides up-to-date support tables of front-end web technologies on desktop and mobile browsers. 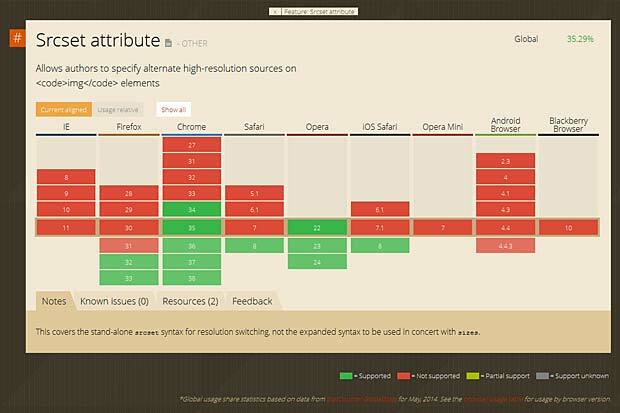 Actually the <picture> element is only supported by Firefox version 33. The srcset attribute is only supported by Firefox versions >32, Chrome versions > 34, Safari version 8 and Opera versions > 22. The poor support of the <picture> element and the srcset attribute in actual browsers does not mean that you have to wait before implementing responsive images in your website. Scott Jehl from Filament Group developped a great polyfill called PictureFill supporting the <picture> element and the srcset and sizes attributes. The PictureFill syntax is not quite the same as the specification. The fallback src attribute was intentionally removed to prevent images from being downloaded twice. The CSS4 image-set function is also trying to deliver the most appropriate image resolution based on the connection speed. So, regardless of the screen resolution, if the user accesses the image through a slow Internet connection, the smaller-sized image will be delivered. CSS4 image-set is still experimental. It is only supported in Safari 6 and Google Chrome 21 where it is prefixed with -webkit. The responsive image standards leave the burden to create images at appropriate sizes, resolutions and formats to the web developer. Client hints are a way to offload this work to the server. Client hints are HTTP headers that give the server some information about the device and the requested resource. Ilya Grigorik, web performance engineer and developer advocate at Google, submitted in December 2013 an Internet Draft “HTTP client hints” to the Internet Network Working Group of the Internet Engineering Task Force (IETF). The draft specifies two new headers for the HTTP 2.0 version : CH-DPR for device pixel ratio and CH-RW for resource width. A server-side script will generate the best image for the requesting device and deliver it. There are some new image formats like JPEG2000, JPEG XR and WebP that generate higher quality images with smaller file sizes, but they aren’t widely supported. JPEG 2000 is scalable in nature, meaning that it can be decoded in a number of ways. By truncating the codestream at any point, one may obtain a representation of the image at a lower resolution. But the web already has this type of responsive image format, which is progressive JPEG, if we get the browsers to download only the neccesary bytes of the picture (i.e. with the byte range HTTP header). The main problem is that the new image formats will take long to implement and deploy, and will have no fallback for older browsers. Some HTML elements don’t work with responsive layouts. Among these are iFrames, which you may need to use when embedding content from external sources. Other elements are Image Maps which are lists of coordinates relating to a specific image, created in order to hyperlink areas of the image to different destinations. When you embed content from an external source with an iFrame, you must include width and height attributes. Wihtout these parameters, the iframe will disappear because it would have no dimensions. Unfortunaltely you can’t fix this in your css style sheet. Setting the position to relative lets us use absolute positioning for the iframe itself. The padding-bottom value is calculated out of the aspect ratio of the iFrame, which in this case is 480 / 640 = 75%. The height is set to 0 because padding-bottom gives the element the height it needs. The width will automatically resize with the responsive element included in the wrapping div. Setting overflow to hidden ensures that any content flowing outside of this element will be hidden from view. Absolute positioning must be used because the containing element has a height of 0. The top and left properties position the iFrame correctly in the containing element. The width and height properties ensure that the iFrame takes up 100% of the space used by the containing element set with padding. Image maps are a co-ordinate representations of images in sections mostly in rectangular, poly and circle format. According to the specs percent values can be used for coordinates, but no major browsers understand them correctly and all interpret coordinates as pixel coordinates. The result is that image maps applied to responsive images don’t work as expected when images are resized. It’s necessary to recalculate the area coordinates to match the actual image size. Responsive webdesign needs not only adaptive images, but also fluid videos. The pioneers in emdedding responsive videos in webpages are Chris Coyier and Dave Rupert. They created in 2011 FitVids, a lightweight, easy-to-use jQuery plugin for reactive width video embeds. FitVids automates the Intrinsic Ratio Method by Thierry Koblentz to achieve fluid width videos in your responsive web design. The source code is available at Github. With modal dialogs (overlays), users don’t have to deal with multiple windows. When a modal window opens, it opens inside the current page and users don’t have to deal with extra windows popping up. When a modal dialog is shown, the content beneath the overlay cannot be acted upon until the overlay is dismissed. Modal overlays don’t allow you to refer back and forth between two sources of information, or move fluidly between two actions. Today it is good practice to darken the parent window to provide a visual indicator to the user that the main window is inactive. This technique is usually called Lightbox. In Responsive Web Design implementations, Web URLs are consistent across devices and adapt their content based on the capabilities of the browser in which they are displayed. Server side solutions, on the other hand, only send what a client needs. But server-side solutions generally rely on user agent redirects to device-specific code templates. Each device class that warrants adaptation needs its own set of templates and these templates may ultimately contain duplicative code that actually applies to every class of device. Post formats have been around since WordPress 3.1. They specify the format applied to a content. Post formats are different from Post Types which specify the type of content : post, page or maybe a custom type like books or products. They need to be styled further in the corresponding css-file. Each image has an innate, original height and width that can be derived from the image data. This derived height and width information is content, not layout, and should therefore be rendered as HTML <img> element attributes. To override height and width for adaptive images, CSS is the best approach. But scaling down images is not sufficient. Sending huge image files to low-performance devices with narrow screens is not very clever. The early HTML image tags had a lowscr attribute which is no longer supported by modern browsers. Sending the right-sized image to devices without wasting bandwith is one of the challenges in responsive web design. The main problem is that the HTML img tag has only one source attribute today. “Starting with small images for mobiles and upgrade to large images for desktops, without loading both and working with all browsers” is the goal of responsive design with context-aware images. Until now there is no solution that meets this objectif. Enabling Google Chrome Frame is simple. For most web pages, all you have to do is add a single tag to your pages and detect whether your users have installed Google Chrome Frame. If Google Chrome Frame is not installed, you can direct your users to an installation page. If Google Chrome Frame is installed, it detects the tag you added and works automatically. The Semantic Web is a collaborative movement led by the international standards body W3C. The Semantic Web is a Web of Data, as opposed to the existing Web of Documents. The goal of the Web of Data is to enable computers to do more useful work and to develop systems that can support trusted interactions over the network. The Web of Data is empowered by new technologies such as RDFa (Resource Description Framework-in attributes), SPARQL, OWL (Web Ontology Language), SKOS (Simple Knowledge Organization System), Microdata and Open Graph. HTML (HyperText Markup Language) remains still the main markup language for displaying web pages and other information that can be displayed in a web browser. Semantic HTML refers to the semantic elements and attributes of HTML (h1, h2, …, p, …), as opposed to the presentational HTML elements and attributes (center, font, b, …). The acronym POSH was coined in 2007 for semantic HTML, as a shorthand abbreviation for “plain old semantic HTML”. <header> : this tag replaces the <div class=”header”>, commonly used in the past by most designers. The header element contains introductory information to a section or page. <footer> : same as above, it’s the well known <div class=”footer”>. 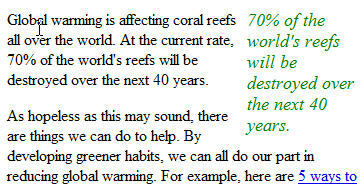 The footer element is for marking up the baseline of the current page and of each section contained in the page. <nav> : replacement for <div class=”navigation”>. The nav element is reserved for the primary navigation. Not all link groups in a page or section need to be contained within the <nav> element. <section> : this is the replacement for the generic flow container <div> when it contains related content. <div> is a block-level element with no additional semantic meaning, whereas <section> is a sectioning element which has normally a header and a footer and represents a generic document or application section. <article> : the <article> element represents a portion of a page or section which can stand alone and makes sense even outside the context of the page. Like <section>, an <article> generally has a header and a footer. You should avoid nesting an <article> inside another <article>. <aside> : this tag is used to represent content that is related to the surrounding content within an section, article or web page, but could still stand alone in its own right. (see figure at right). This type of content is often represented in sidebars. <hgroup> : A special header element that must contain at least two <h1>-<h6> tags and nothing else. It’s a group of titles with subtitles. Make sure to maintain the <h1> – <h6> hierarchy. RDFa is a W3C Recommendation that adds a set of attribute-level extensions (rich metadata) to web documents. RDFa 1.1 was approved in June 2012. It differs from RDFa 1.0 in that it no longer relies on the XML-specific namespace mechanism, but ca be used with non-XML document types such as HTML 4 or HTML 5. eRDF is an alternative to RDFa. SPARQL is an RDF query language. On 15 January 2008, SPARQL 1.0 became an official W3C Recommendation. OWL is a family of knowledge representation languages for authoring ontologies. An ontology formally represents knowledge as a set of concepts within a domain in computer science and information science, and the relationships among those concepts. Ontologies are the structural frameworks for organizing information and are used, among others, in artificial intelligence. SKOS is a family of formal languages designed for representation of of structured controlled vocabulary (thesauri, classification schemes, taxonomies, …). Microdata is a WHATWG specification used to nest semantics within existing content on web pages. The Open Graph protocol, originally created by Facebook, enables any web page to become a rich object in a social graph. All these technologies help computers such as search engines and web crawlers better understand what information is contained in a web page, providing better search results for users. Another set of simple, structured open data formats, built upon existing standards, is Microformats. One difference with the other semantic technologies is that Microformats is designed for humans first and machines second.